Participants enter the track during the the McAllen Kids Marathon at McAllen Veterans Memorial Stadium on Saturday, Sept. 28, 2018, in McAllen. 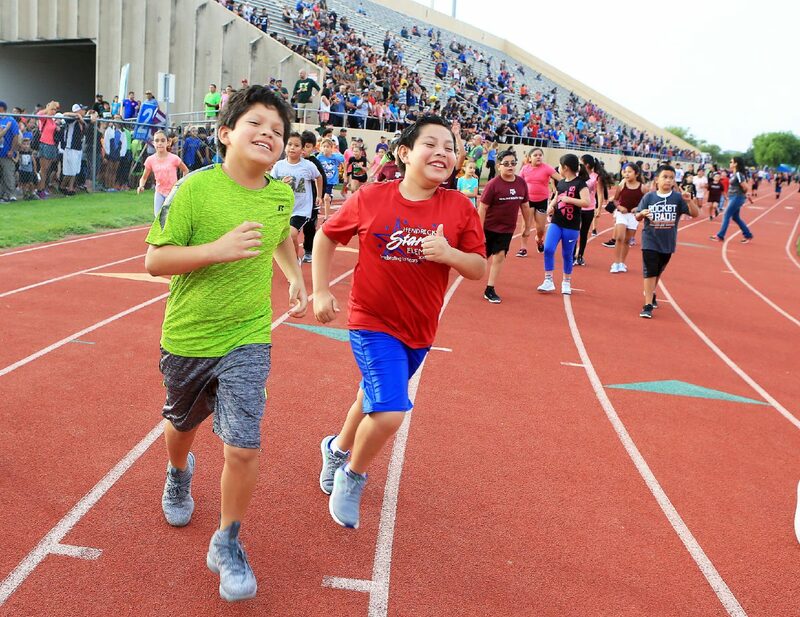 The McAllen Kids Marathon kickoff was quite the spectacle Saturday morning, as thousands of children were accompanied by their parents at McAllen Veterans Memorial Stadium for what has become an annual activity encouraging participants to log a marathon’s-worth of miles by January. Such festivities accomplish more than just gathering families for a little fun, but they commit our daughters and sons to a months-long project that inspires community engagement and fitness. Consider the atmosphere at these events, which are not unlike a high school football game or pep rally, and are just as well-attended. The fifth annual marathon launch was no exception Saturday, which is a testament to the efforts of the event’s organizers and sponsors. McAllen ISD has for several years partnered with local government, business and professional communities to aid in the effort, with the city of McAllen, Telemundo, H-E-B, Rio Grande Regional Hospital and the Boys & Girls Club of McAllen serving as partners. We at The Monitor have also been there since the beginning, thanks to the tireless efforts of our former opinion editor, Sandra Sanchez, spearheading much of the planning and activities. We congratulate those who lit the flame and the individuals and institutions who continue to carry it for our kiddos; for bearing the responsibility of instilling a healthier lifestyle in our community’s youth. Their efforts were on display in grand fashion. While there are many efforts to encourage health and wellness in America, the kids marathon in McAllen is unique in that it has become a genuine community-wide effort — each of us taking ownership of our children, and living by the old adage that it does indeed take a village to raise a child. After all, the sight of a little tyke with a smartphone is not uncommon today. Go to most any store, movie theater or even classroom, and chances are you’ll see kids with their heads buried in an iPhone or Android device. While times have undoubtedly changed in this tech-consuming world we now live in, there was also a time in the not-too-distant past when video game consoles captivated our youth (it still does) and it was all parents could do to pull their children from the TV to enjoy some fresh air. Granted, generation after generation, there has always been some new-fangled object that has forced us to compete for the attention of our young ones. But while nothing has really changed in that regard, the convenience of modern technology has only perpetuated our sedentary lifestyles. Ironically, flagship companies, such as Apple, acknowledge the need to decrease this dependency by implementing software on their products that can track our usage, monitor our heart rates and even remind us when we need to stand up and move around a bit. Remember that it was just in March when a national poll found that the McAllen-Edinburg-Mission metropolitan area was again considered among the fattest in the United States, finding here the highest share of physically inactive adults — 36.9 percent, nearly three times higher than the Provo, Utah area, which reported the lowest share. This Wallethub.com study came just a few years after a 2012 and 2013 Gallup Poll found the metro area the most obese in the nation. Moving kids, and let’s be honest, grown men and women to more physical activity has never been more difficult. The marathon is a necessary force in reversing that trend and has served to motivate youngsters to do their part.